Since the late nineteenth century, archaeologists, documentary-makers and novelists have asserted that the Cretan Labyrinth – the lair of the terrifying Minotaur – was a real place. But now a major paper suggests that the legendary maze was just that – legend, a figment of collective imagination. The labyrinth is popularly held to have been in the Palace of Knossos, built around 1950 BCE, the ruins of which stand near the city of Heraklion on the north coast of Crete. This is wrong, according to Antonis Kotsonas, a classical archaeologist from the University of Cincinnati, US. In a paper published in the American Journal of Archaeology, the researcher, using a cross-disciplinary study, points to the absence of any actual evidence that Iron Age Cretans built any form of monumental labyrinth in Knossos. Kotsonas suggests the Cretan Labyrinth is a monument only in memory, regardless of it being “considered a monument that once actually existed”. Yet the search for a maze under or the near the very real Bronze Age Knossos site has taken on legendary proportions. As myth has it, Daedalus, the head architect of the tyrannical King Minos of Crete, built a complex maze under his palace. The maze housed the Minotaur, the monstrous half-man-half-bull that fed on seven virgin men and seven virgin girls from Athens every three years. 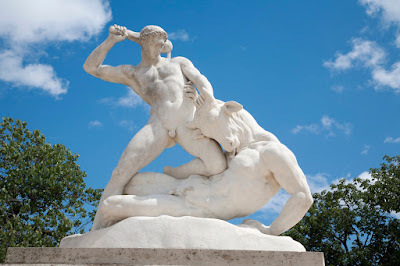 Theseus kills the Minotaur and ends the tradition. Kotsonas notes that the earliest surviving versions of the story – from Homer, Herodotus and Pherecydes – make no mention of a Cretan Labyrinth. For Plato and beyond, the term labyrinth is used only to describe “structures and metaphorically situations that are hard to escape”. Kallimachos, a third century BCE writer from Alexandria in Ptolemaic Egypt, is the first source Kotsonas cites that specifically links the Minotaur with the Cretan Labyrinth. He suggests that Kallimachos kne of the Egyptian labyrinth – an undoubtedly real structure built by King Amenemhet III sometime before his death in 1770 BCE – and simply “spread … the term in Cretan mythology”. Two later Hellenistic references to the Cretan Labyrinth also come from scholars in Ptolemaic Egypt. The real currency of the Cretan Labyrinth rose after the Roman annexation of Crete around 66 BCE. The Romans treated its existence as real, and placed its location explicitly in Knossos. It was essentially a political decision. Romans anchored their imperial power on their own re-imagined vision of themselves as inheritors of Classical Greece. However, there are real labyrinthine cave structures carved out of limestone near the ancient Roman city of Gortyn, in the heartland of Crete, which also add to speculation. Possibly pre-Hellenic mines, the caves were used as hiding places for Christians during various Ottoman Turkish massacres – a fact frequently ignored by classicists and antiquarians determined to place the labyrinth in Knossos. In the end, though, there is no conclusive evidence that a labyrinth, much less the fearsome bull-hybrid, ever existed in Knossos. Kotsonas weaves a detailed account of how Western anxieties, values, and politics, melded with a newly created Greek national identity in the battle against Ottoman imperialism, may have given birth to a monument that lives only in memory. However, despite the fact that it never existed, the Cretan Labyrinth will no doubt maintain its role as a place of fear and dread, wonder and enlightenment – as a reference in popular culture from Disney to Coke, featuring the Minotaur and his lair. For the full article, please visit Cosmos Magazine.